ASTra is a replicable Deaf and Hard of Hearing Educational Advocacy Program that embodies the mission and vision of Hands & Voices, which is to provide support to families with children who are deaf or hard of hearing (D/HH) without a bias around communication mode, method, and educational setting so that every child who is D/HH has the opportunity to achieve their full potential. ASTra content is derived from years of direct advocacy experience working with families in schools, attending advocacy trainings from legal experts, providing trainings, and the Hands & Voices Educational Advocacy Guidebook (©2013). ASTra can be implemented by a Hands & Voices Chapter independently or in collaboration with an agency or program partner. 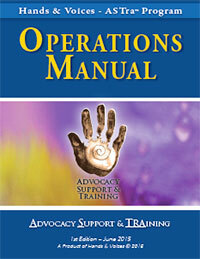 An agency or program partner can instigate the start-up of an ASTra Program only through the local Hands & Voices Chapter in accordance with the operational procedures of this program. .
On this page are links to lots of resources and information about ASTra, including materials that are available by password-only access to Hands & Voices chapters who have an ASTra program or are in the start-up process. All the documents a Chapter will need to start and maintain an ASTra Program. **ASTra personnel only. Many families struggle in their attempts to improve educational programs for their children, and the support they find is usually not experienced with the unique issues facing deaf or hard of hearing kids. 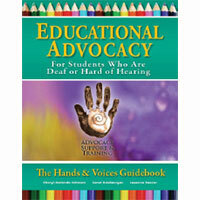 Hands & Voices is often asked to provide educational advocacy support to families (and professionals) who have questions about special education law and its applicability to students who are deaf or hard of hearing. In our H&V chapters, it's not at all uncommon to find an H&V trained advocate supporting a family who is struggling with their child's educational services and communication access. H&V chapters can provide families with advocacy resources, support, and in some cases, attend an IEP meeting with a family. View our chapter listings to see if this service is available in your area. While we're not attorneys, and we can't give legal advice, we do feel strongly that experienced parents can be great assets to other families new to educational advocacy. ASTra Advocacy Request Form - Download MS Word doc file. P.E.I. “Parent Education Initiative” * Download PEI form as a printable pdf. Transition to Pre-School - Download Lisa Kovacs Transition article in pdf form.